Model building and Painting Service. Some of our resin props can be painted by us to a high standard. 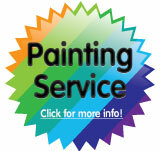 We use safe acrylic (water based) airbrush paints and sealers. You can even send something to us even if we didn't make it, we will quote on an indvidual basis. Just get in touch! Normal price for the larger weapons is £60, just check the prop's option when you add to basket. We try very hard to give you exactly what you see in the pictures on the website. Of course painting can be very subjective for some people, if you require exact paint jobs from the movies/tv series, maybe you need to purchase the more expensive ready-made props from master replicas etc..
We sand, fill and prime all our models, then airbrush. We finish them by hand for all the small fiddly bits, and apply a clear varnish to finish. Please notice the lead time needed to complete your order will be 5-6 Weeks (sometimes longer depending on complexity). All model kits are made to order, and if you want to change the colours you will need to tell us before work starts.